Mark’s sells various brands of new and used woodworking and metalworking equipment. Used equipment comes in and out on a continuous basis, so it is best to check our website periodically to see if we have that particular item for which you have been looking. 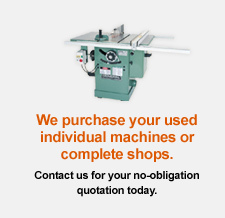 We specialize in the King Canada line of NEW woodworking and metalworking equipment. We also sell the complete line of Silver woodworking products, as well as Airtek air compressors. As for USED brands of equipment, we sell any brand which becomes available at a particular time. We offer an extensive and flexible trade-in program, tailored to suit your growing business or hobbying needs. Trade up to larger equipment, update your shop, or exchange that seldom-used tool for something you need! If you are looking for an item we do not have in stock, we are happy to pursue the matter through the numerous contacts we have built up over the last 30 years, with the objective of finding your requested item.